Books - FUNdoing. People. Together. Learning. Super portable team building activities! Use any type of plastic cups. Suitable for middles school ages and older. Activities for small and large groups. Book excerpt and more details HERE. 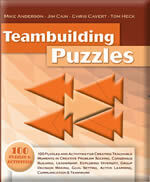 Filled with a variety of teambuilding activities ranging in challenge level - the three sections include: Initiative Tests, Notable Variations, and Portable Elements including complete building directions for the PVCystem. Make it and take it anywhere. Suitable activities for 12 years of age and older. Find complete details HERE including an activity excerpt from the book. Another full write-up of one of my favorites from the book HERE. This book is an instructional guide describing 25 ways to use Chiji Cards to create key moments of learning for groups. Team building and processing activities included. Compatible with ages 12 and older. Chiji is a Chinese term for important moment or significant opportunity. The Chiji Cards, developed by the Institute for Experiential Education, are a set of 48 colorful graphic images that can be used for group development and processing activities. This book is filled with Ice-Breakers, Communication and Problem-Solving activities, as well as energizers and just plain fun. NO EQUIPMENT NEEDED. This experiential activity book was put together by teachers for teachers. The activities in this book focus on developing pro-social skills that will help both children and adults interact in positive and caring ways. Lead Playful Activities with Large Groups - gain helpful insight on how to set up, plan, and manage large group team building events. This all-in-one resource is a must-have for anyone in charge of large group programs. Activities to Initiate Group Discussions - a book full of 10 to 20 minute activities that help get groups talking about gender issues, rumors and their effects, creativity, communication, and expressions of emotions like frustration, anger, happiness and belonging. A Working Book of Initiative Activities & Problem Solving Elements - is an essential tool for educators, counselors, trainers, and others interested in beginning or boosting the offerings of a challenge course program at minimal cost. More Activities to Initiate Group Discussions - more engaging experiences that require minimal and affordable props and adapt easily to different situations and age groups. The 10 to 20 minute activities in this book are catalysts for topical conversations. Loads of Land Games with Foam Noodle Toys - use durable low-cost noodles for fun filled group activities outside of the pool. 50 active games, icebreakers, energizers, and problem-solving exercises. Compatible with ages 10 and older. Loads of Land and Water Games with Foam Noodle Toys - more active games, icebreakers, energizers and problem-solving activities for land AND water activity programming. Captivate and engage your groups with colorful fun!! Join the growing number of players taking part in reaction ball games like Ricochet, One More, Over the Line, Grouper and more..... See the Ricochet page for the "Buy at:" option and more information about these exciting, engaging, and positively addicting activities. This massive collection (1001 Colorful Quandaries) of open-ended questions was designed to encourage youth and adults alike to think beyond daily occurrences and stretch the imagination to the possibilities of life. Examples: Are you more like a microwave or a stove? ...a car or a motorcycle? ...an iPod or an iPad? What would it be like to be a king? ...a school teacher? ...a movie star? ...a migrant worker? These "quandaries" are good for group icebreakers, journal prompts, and topical discussions.